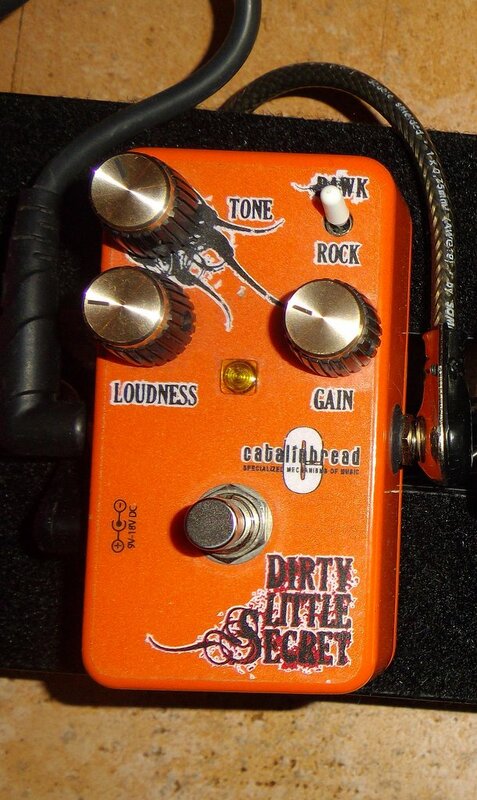 Dirty Little Secret, Overdrive pedal from Catalinbread. 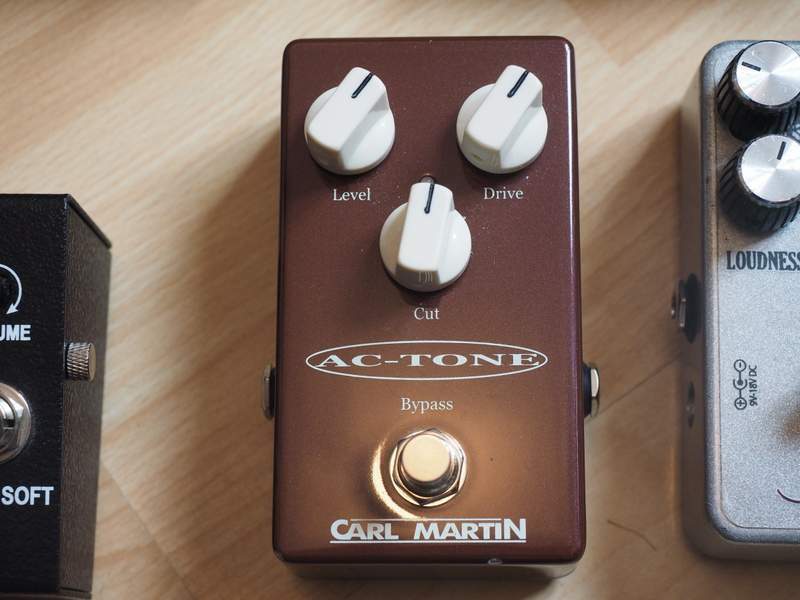 This is a fairly simple pedal. Volume, tone, and gain. It has a rock/rawk switch. One more interesting feature is the optional variable voltage which changes the sound according to Catalinbread. This pedal is supposed to turn any amp in a cranked marshall more or less. 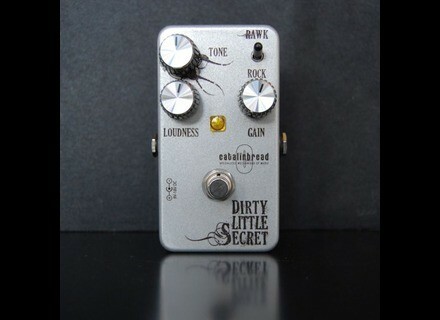 It’s a fairly high end pedal and the price reflects that. Structurally it feels solid. I typically run it with the volume very low with the gain and tone around noon. I could never decide whether I liked the Rock or Rawk better. The Rock is supposed to be a plexi sound while the rawk is more of a jcm800 thing. To my ears the rock mode sounds like zeppelin while the rawk mode gives an 80's metal thickness. Both are great. One gripe I have is while the pedal feels very solid and well made, the knobs are very sensitive and easy to turn. This is a problem live and I have to resort to duct tape to make them stay. Initially I did not like this pedal. I was running it at 9 volts and it sounded thin compared to some of my other overdrives. However, Catalinbread recommends trying it at 18v so I did. The difference was huge. The pedal got a lot thicker and fuller sounding. The Rock mode is great for Zeppelin or anything 70’s rock, just as the name suggests. It has that open midrangey tone associated with those bands. Using it through a Matchless Spitfire it really roared. The Rawk mode is more pushing and saturated. The voicing is a lot more modern. The comparison to a JCM800 is spot on. I like both modes a lot. I like them more with 18 volts. The bottom line with the DLS is to try it at 18 volts before you dismiss it. At the usually 9v it’s just doesn’t sound quite the same. If you want cranked Marshall sounds from 1970 to 2000, this pedal with do it for you. That in itself is very impressive. The voltage caveat is an issue if you don't have the right PSU. denied's review"Marshall in a box!" - Controls for volume, tone, gain. - Runs on 9v battery, can also be run by an adapter, up to 18v. 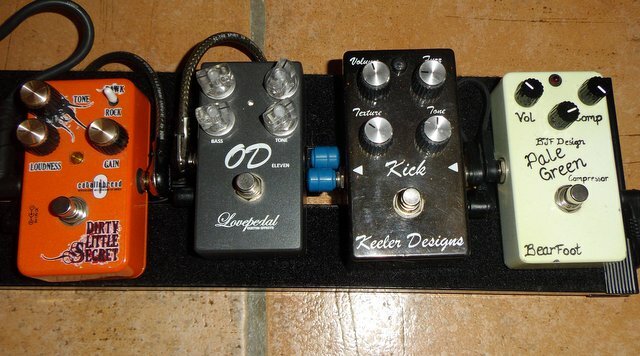 Standard OD pedal setup. I’d have preferred separate bass and treble controls, but the standard tone control works just fine. The rock/rock switch is pretty much constantly switched to rawk. Never had any kinds of reliability issues with it. Being able to run it at different kinds of voltages really opens up the gain possibilities with this one. I do wish it had a little more gain on tap even at higher voltages. Really just a straight up OD/Dist pedal. British Marshall crunch captured and put in a little box. Really incredible how well this one came out, serious props to Nick at Catalinbread. It responds very dynamically to your picking, clipping harder the deeper you dig in. Very harmonically rich and balanced. The rawk mode is a little more hairy and aggressive, with the rock mode more on the loose side. I haven’t found a whole lot of uses for the rock mode, but that is mostly personal preference. 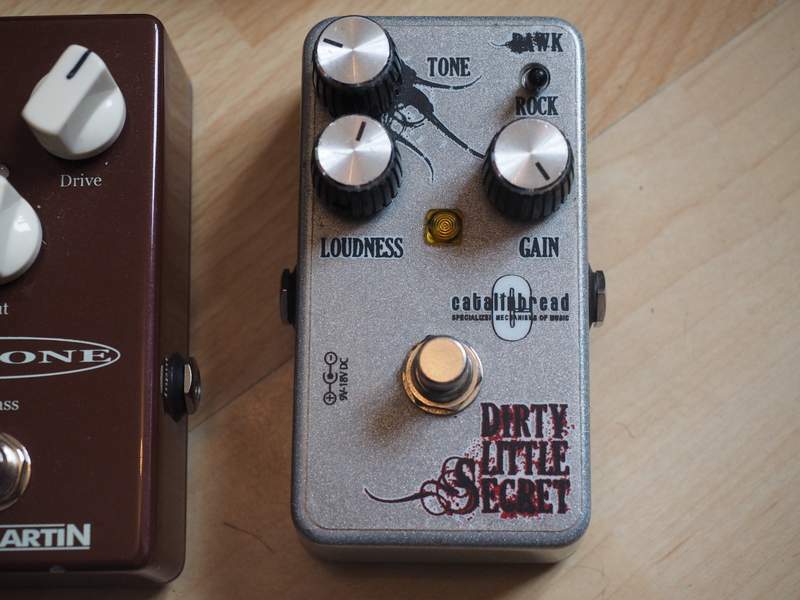 As mentioned early, I would have liked the pedal to have a little bit more gain on tap, but then again, isn’t really intended to be a high gain OD. 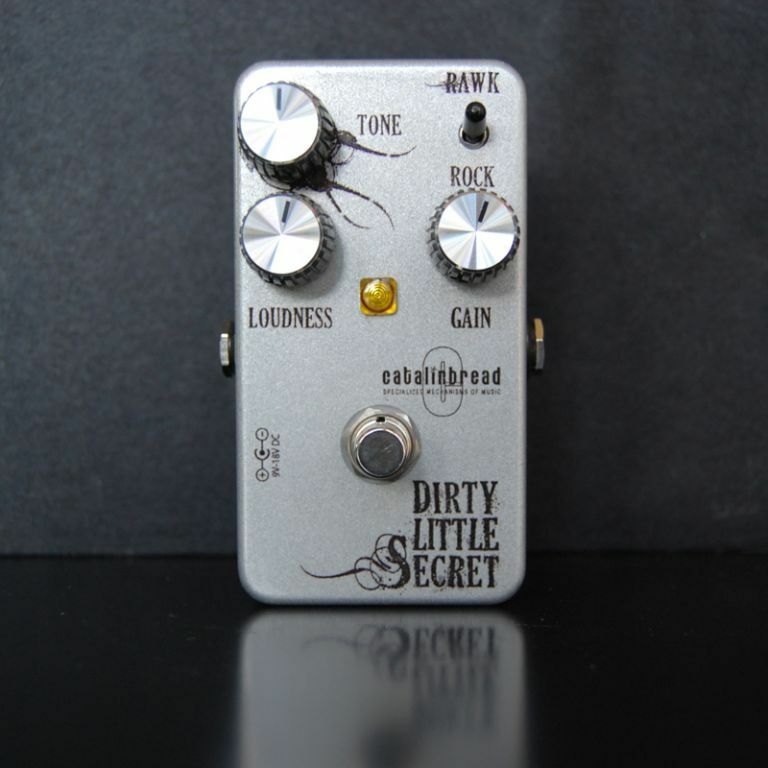 Overall a fantastic OD pedal that really captures the sound of British crunch. It has quite a bit of versatility through the tone, gain, and rock/rawk switch, but it is all going to come in along the lines of an old Marshall. I am delighted with the touch sensitivity and dynamic preservation, as well as its ability to meld seamlessly with other dirt pedals. Catalinbread is a great boutique company, and this is one of their nicest offerings. There are a few floating out there with badass custom finishes, so keep an eye out. savardgiom's review (This content has been automatically translated from French)" Fender to sound like Marshall"
This is an overdrive. 2 modes: rock and raw. Very classic. Small pedal. I love that brand. Configuration: tone, gain and volume. And switch rock / raw which reinforces the distortion. Very easy to get WHAT THIS PEDAL does best: transform a Fender amp in the Marshall. It is effective. I love how it hangs (type AC / DC), the rock aspect. Sometimes a little hollow in the grave, but rather an advantage in the final mix (mix live mostly). I love it. I care. She does well, once again, for which it is miraculous out of my Fender sound rock to Marshall. 20/20's review (This content has been automatically translated from French)" a super secret Fender amps ..."
A fairly wide range notament via the switch rock / rawk. The light crunch to overdrive relatively vitamin. Drive on the scale of 0 to 10 I would say it covers 1 to 6. Often presented as a Marshall in a box, this pedal excels on Fender amps in very bright clean and slamming (twin, deluxe, princeton reverb ...). Used in my case with a silverface princeton reverb pedal and the true grail for me. Finish cheap? Not quite basic. Seems robust (ras). I have two! Super price / quality ratio.